This was a really fun concert and day leading up to it. I volunteered to drive a bunch of us down to the show from Greeley. My band mates and some of our buds and hangers on. You see, I had a 1968 Dodge Adventurer Truck, nicknamed "The Deuce" after the Army's "deuce and a half" transport. Well, It had a camper shell, and I hauled about 10 or 12 of us down there. We left early that day, stopped at a 4th of July Party around lunchtime in Lakewood, then proceeded to head to the show. 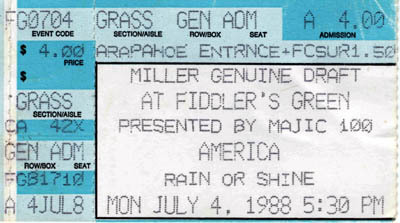 The show was at the recently opened Fiddler's Green. Hadn't been there yet, and I was interested in checking it out. I stayed sober, so that everyone else could party and have a good time (I was repaid when I got home big time). The show was great. Real mellow. Most definitely a family event. I remember them saying they were going to play Sister Golden Hair, a song that they hadn't played in years. Well, it was real nice. Dewey and the boys played all their hits. Because of it being a 4th of July Party, there was a huge fireworks display afterwards. Well, uh, I don't think they planned for the winds to carry the shells over the dried fields around Fiddler's (it's not like that now by the way). They caused huge grass fires. Needless to say, it took us a while to get out of there due to the fire engines etc. It was a long drive home after being in the sun all day, but was still a very memorable show. Were you at this show? e-mail me at fenderamp_99@yahoo.com and tell your experience/comments. I will post them here.